The sun. What would we do without it? Die faster. 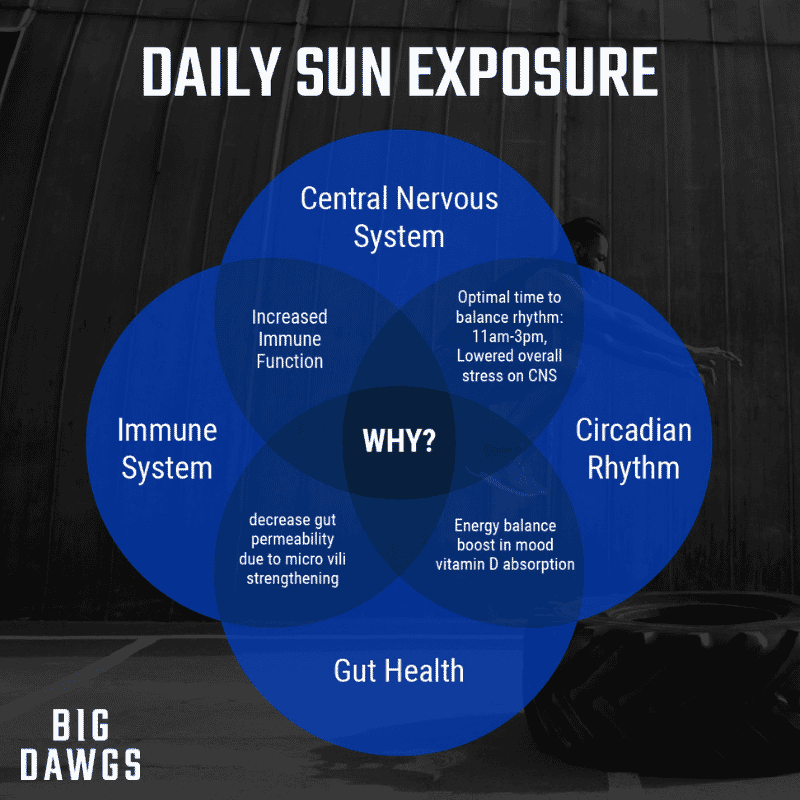 One of the simplest ways we can increase performance, recovery, mood, digestive health, immune function, and neurological health is by getting direct sunlight each day. Let’s break down these benefits and see how we can start implementing direct skin exposure to maximize the sun’s powerful effect on our body. Most important benefit of direct sunlight? Vitamin D. Vitamin D is a fat-soluble secosteroid that increases intestinal absorption of Magnesium (which is responsible for over 300 enzymatic processes in the body alone), Calcium, Phosphate in addition to playing a vital role in multiple biological processes. According to data from the Endocrine Society, nearly everyone in the United States, Europe, and Canada are Vitamin D deficient. Additionally, food sources are not a robust source of vitamin D. The most powerful source of vitamin D is found in UV light exposure from the sun. Our skin uses UV light to synthesize Cholecalciferol (Vitamin D3) which is sent to the liver to be converted into its active form. Serotonin is a neurotransmitter that plays a part in regulating our emotional state. We know from research that vitamin D is needed to convert tryptophan to serotonin. By ensuring our vitamin D levels are in optimal ranges we can optimize our ability to create enough serotonin allowing us to regulate our mood more effectively. As mentioned in one of my previous posts discussing circadian rhythm, our body operates on a clock driven by the Suprachiasmatic Nucleus (SCN). The SCN is regulated by the sun and moon. Sunlight stimulates activity and wakefulness while darkness stimulates rest and recovery. By getting direct sunlight on the skin each day when the sun is at the highest in the sky we will keep our SCN in rhythm and subsequently lower overall stress on the nervous system. Research has shown a strong connection with optimal vitamin D levels and strength, lean mass gains. Vitamin D plays a vital role in hormonal development and immune function. In order to maximize our ability to synthesize new tissue via anabolism, which is predicated on regulating systemic inflammation and stress, optimal vitamin D levels will aid in this process. Rhee, Han & Vries, Esther & Coebergh, Jan. (2016). Regular sun exposure benefits health. Medical Hypotheses. 97. 10.1016/j.mehy.2016.10.011. Lee, David & Tajar, Abdelouahid & Pye, Stephen & Boonen, Steven & Vanderschueren, Dirk & Bouillon, Roger & W O'Neill, Terence & Bártfai, György & F Casanueva, Felipe & D Finn, Joseph & Forti, Gianni & Giwercman, Aleksander & S Han, Thang & Huhtaniemi, Ilpo & Kula, Krzysztof & E J Lean, Michael & Pendleton, Neil & Punab, Margus & Wu, Frederick. (2011). Association of hypogonadism with vitamin D status: The European Male Ageing Study. European journal of endocrinology / European Federation of Endocrine Societies. 166. 77-85. 10.1530/EJE-11-0743.